Manchester United’s FA Cup 4th round meeting with Tottenham Hotspur on Saturday was notable for the first team debuts of three young United players. Their chances may have come as a result of a lengthy injury list at Old Trafford, but their appearance undoubtedly added some much-needed sparkle to a fixture that had threatened to be overshadowed by more pressing concerns for both teams in the Premier League. Thrusting three new players aged 21 or under into first team action for the first time is a rarity in these days of squads numbering 25 or more, but at clubs with the youth traditions of United in particular, there is still little that excites the fans more than seeing these youngsters shine on the pitch. Maintaining this proud tradition has, indeed, been like an elixir of life for Sir Alex Ferguson himself in his 22 years in charge of the club. The undoubted new star for United this season has been the right-back, Rafael da Silva, but fans have also eagerly awaited the appearance of identical twin Fabio, who resembles his brother in every way other than the fact he plays on the left. Ironically, it was an injury to Rafael that gave Fabio his opportunity at the weekend, but supporters were quickly impressed with a debut showing that was lively from its very outset. His appearance was unfortunately cut short by injury early in the second half, but this then allowed Richard Eckersley to come off the bench and complete another pair of United siblings, after elder brother Adam made one Carling Cup appearance back in 2005. Finally, Zoran Tošić also entered the fray for his first outing since signing from Partizan Belgrade in the January transfer window, and despite only being given 18 minutes to impress on this occasion, the Premier League will doubtless be seeing more of the Serbian in the weeks and months to come. It was fitting that Gary Neville and Paul Scholes were also on the pitch to oversee the introduction of this new generation, but such juxtaposition of eras also served to highlight just how much football has changed in the last 20 years. The 1992 FA Youth Cup winning generation, which also featured Ryan Giggs and David Beckham, would still be exceptional in any era, but the young players joining the first team squads of top teams today hail from all four corners of the globe. Serbian international Tošić (21) arrived from Partizan together with Adem Ljajić (17), supposedly an even bigger prospect, for the joint sum of £16.3 million. The Brazilian da Silva twins, meanwhile, signed their first deals with United at the age of 16, despite FIFA rules making them ineligible to play until their 18th birthday, and eventually moved to Manchester a year ago without ever having played for the Fluminense first eleven. Of course, the influx of players from overseas has been a constant theme in English football since the Premier League was formed, but its progression into youth squads has come about partly as a result of the FA’s academy system. The system, which was introduced in 1998, has been rightly commended for its attempts to ensure that England’s budding footballers receive a thorough education both on and off the pitch, but has been a source of contention for clubs already possessing well-developed youth set-ups due to a rule that states that domestic recruits must live within a 90-minute radius of the training facility. Unable now to scout players from other parts of the country, clubs like United have reacted, however, by broadening their searches to cover virtually the entire planet, with names such as Gerard Piqué (now at Barcelona), Giuseppe Rossi (Villarreal), and the da Silva twins, as well as future prospects like Rodrigo Possebon (19, ex-Internacional) and Federico Macheda (17, ex-Lazio) having already joined the club as teenagers. Young players already beginning to make a name for themselves overseas, such as Tošić, Cristiano Ronaldo, and Anderson have joined for massive transfer fees, with the thinking being that the right development will see them blossom into true superstars. Hailing from London, David Beckham could not have joined the United academy under the current regulations, but for local boys like the Salford-born Eckersley brothers, competition is now fiercer and more global than ever before. This trend is not necessarily disastrous, and the emergence of players like Rafael and Fabio remains a source of real excitement to United fans, but one cannot help but remember their first glimpses of Scholes and Giggs with slightly greater affection. Just as Eric Cantona was a significant figure in the development of the young United side of the 1990s, young Japanese players too have been helped by overseas role models such as Dunga, Dragan Stojković, and Sidiclei, but the key, common factor here is that the real learning has always happened on the pitch itself. Unbound by the Bosman ruling, the J League is at least still able to provide its fans with the sense of pride and affinity they feel at seeing local lads, such as Michihiro Yasuda (Gamba Osaka; from Suita, Osaka) and Shinji Kagawa (Cerezo Osaka; born just down the road in Kobe), come good for club and country. With a first ever Asian title, third place in the Club World Cup, and victory in the Emperor’s Cup to boot, the 2008 season was – on paper – the finest in Gamba Osaka’s history. The fruits of autumn and the performances of Yasuhito Endo et al in midfield, however, served to paper over some serious cracks in the side that require urgent repair. Amidst what was admittedly a congested league table, a team that had enjoyed year-on-year improvement up to 2007 saw both its points and its goals tallies drop away dramatically, and with significantly more goals conceded as well, Gamba could only finish the season in eighth place – their lowest for five years. In these frugal times, the Japanese transfer market has been no less stagnant this year than the European, but in light of such clear need for reinforcement, it is no surprise that Akira Nishino has been one of the busier managers so far. Most striking about Gamba’s troubles last term was the lack of goals. Of course, Bare’s sudden departure in July hardly helped matters – as evidenced by the ten games Gamba went without a win immediately afterwards – but with the hapless Roni proving less than able a substitute, the goals for column fell from the 70+ figures recorded in the previous three seasons to just 46. Nishino, however, is well versed in freshening up his forward line, and just as in the previous four seasons with Araujo, Magno Alves, Bare, and Lucas, the manager has kept with his tried-and-trusted method of bringing in overseas players with J League experience. Leandro struggled with injuries in his final year at Vissel Kobe but boasts a record of 55 goals in 115 games throughout his Japanese career, while Korean international Cho Jae-Jin returns to the J League, where he scored 53 goals in 122 games with Shimizu S-Pulse, after a year back home. Alongside Lucas, Masato Yamazaki, and Ryuji Bando, Gamba now appear to have an embarrassment of riches in the striking department. If Nishino’s experience in rebuilding his forward lines is unquestionable, the defence is another matter entirely. Gamba have always been more of the ‘you score three, we’ll score four’ variety than of one to keep things tight, but replacing the defenders that won the J1 title in 2005 has been somewhat problematic. This time last year, much was expected of new recruits Hiroki Mizumoto, Yohei Fukumoto, and Mineiro, but for varying reasons, each signing was an unmitigated disaster as the three players managed just 346 minutes of league action between them before leaving within the year. This time, Nishino has understandably plumped for greater experience, with the reliable Kazumichi Takagi looking a sensible choice for the heart of the defence. The signing of Park Dong-Hyuk, meanwhile – under the new rule that allows teams a fourth overseas player, on the condition that they are from Asia – was rather more out of left field, with the defender having been out of the Korea squad since 2005, but Park was selected for the K-League’s best XI last season, and was a member of the Ulsan Hyundai Horang-i side that humiliated Gamba with a 6-0 hammering in the A3 Champions Cup in 2006. One player who won’t be joining Gamba, however, is Tsuneyasu Miyamoto, who has instead opted to sign for Vissel Kobe after his Austrian adventure with Red Bull Salzburg. Miyamoto was loved by the masses and the sponsors alike during his 15 years with Gamba, but he was not without his critics; some felt he would not exert himself for Gamba as he would for the national team, and indeed he was occasionally dropped by his club while continuing to serve as Japan captain under Zico. Many Japanese footballers plying their trade abroad ultimately return to their alma maters in the J League, but Masashi Oguro had already been allowed to move to Tokyo Verdy, and the prospects of Nishino giving a second chance to Miyamoto were probably quite slim in the first place as well. Miyamoto’s time in the Austrian Bundesliga was neither a success nor a failure, but undoubtedly key to his decision to move to Kobe was the determination of the club and its owners to qualify for the AFC Champions League in 2010. With this the objective, Vissel too have engaged in much transfer activity, with former Japan striker Kazuki Ganaha and Marcel of Benfica being brought in to replace Leandro and Yoshito Okubo in the forward line. Away from Kansai, the market has generally been quiet so far, but one move that does stand out is the arrival of Davi at Nagoya Grampus. The Brazilian scored 16 goals last year (including one in Nagoya on the penultimate matchday) for a woeful Consadole Sapporo side that managed to accumulate just 18 points all season, but in a team that thrives on the assists of J League Rookie of the Year Yoshizumi Ogawa, much will be expected of Davi as Grampus compete for titles at home and abroad. The image of turkey and stuffing at Christmas in the United Kingdom is so strong that is difficult to imagine anybody, anywhere, eating anything else, even if the reality of our world is of course a lot more diverse. While countries whose cultures have not been so influenced by the Christian faith, such as Japan, may not even take a holiday, even the habits of the West vary with each nation. Meeting with some fellow ‘foreign’ friends at the weekend to catch up after our respective trips home over the festive season (and in the hope that beer would prove to be jet lag’s hidden cure), I learnt that the Christmas meat of choice in Norway is actually mutton, while Dutch people generally cook what they want because they’re far more concerned with St. Nicholas Day, or Sinterklaas, which falls on 6 December. Even if plenty of Americans will still be cooking turkeys, my pal from California eats nothing but Mexican food in respect of his family’s roots. I suppose that, for each of us, the things we grow up with are what define our very sense of ‘normal’. In the UK, the Christmas celebrations carry over onto Boxing Day on the 26th, when we tend to pick over the remaining scraps of turkey with our relatives (ideally, without resorting to pugilistic activity of any kind), and this is an important day within the footballing calendar as well. While most European leagues put their feet up for a winter break, England generally puts on a full programme of fixtures both on Boxing Day and on the 28th, making for one of the busiest times in the whole year. Players may bemoan losing the chance to relax with their families, but as unfathomable as it now sounds, an additional set of league games were also played on 25 December until the 1957/58 season. In part to limit the burden of travel, these were generally organised so that each team would play local derbies athome and away, meaning that anyone whose festive cheer was dampened with defeat on Christmas Day would have an immediate chance for revenge against the same opponents 24 hours later. Even without the back-to-back derbies of the past, the Christmas season remains a massive draw to football supporters and habitually sees some of the highest attendance figures of the season, making an English winter break difficult to implement no matter how many players and managers are in favour. Personally, I spent much of Boxing Day sneaking away from the dinner table to check the Premier League scores on TV, but with most of the non-league action taking place the following day – a Saturday – I was free to enjoy some action at rather more of a grass-root level. 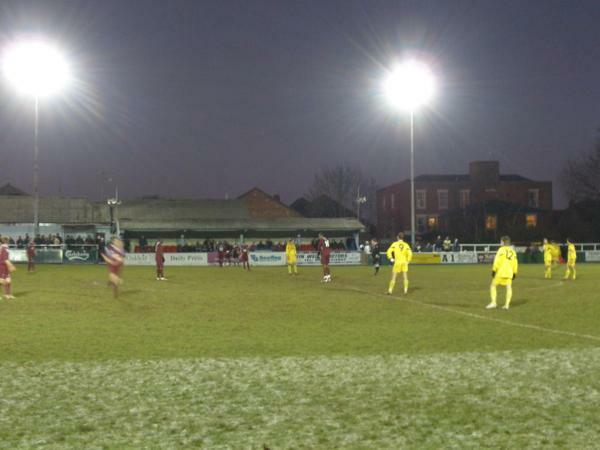 The representatives of my small hometown, Taunton Town, are currently battling against relegation from Division One South & West of the Southern Football League – essentially the regional component of the eighth tier of English football – and as the game kicked off amid freezing temperatures and a setting sun at three in the afternoon, the pitch was still glistening with the morning’s frost. It may all sound a little bleak, but you just can’t beat being among 229 supporters – another season’s best – there that day, drinking hot Bovril under the dim light of the ground’s rather basic floodlights. As the New Year dawns and the Japanese season comes to a close with the final of the Emperor’s Cup on 1 January, the first weekend thereafter represents perhaps the most romantic time in the English football year with the 3rd round of the FA Cup. Without a seeding system as employed in Japan, clubs from the lower and non-leagues have the chance to continue the competition’s long tradition of shocking the big guns from the Premier League. Although Barrow AFC of the Conference National (fifth tier) went down to a narrow 2-1 defeat away to top-flight Middlesbrough, Hartlepool United of League One (third tier) caused an upset by eliminating Stoke City, while another side from the same division, Southend United, earned the chance of a home replay this Wednesday against the giants of Chelsea after a 1-1 draw at Stamford Bridge. Taunton Town, rather sadly, have not made it past the qualifying stages of the FA Cup since the 1981/82 season – a year before I was born – but the Cup did give a me one last chance to enjoy a bit of British football culture as I watched Manchester United’s 3rd round success in the pub with my brother the day before leaving again. There’s nothing, after all, quite like the things you’re used to.